Set the environment in the Environment Settings section of Model Properties. Set the environment using a model variable. In the ModelBuilder menu, click Model > Model Properties. Right-click anywhere on the model diagram and click Model Properties. Expand the category in which the environment is located. Check the check box next to the environments you want to set. You can check multiple boxes in multiple categories. Click Values. The Environment Settings dialog box opens, showing the categories of the settings. Open each category by clicking the Down arrows. Provide a value for each environment. The values supplied will be used by all processes in the model. An unchecked environment setting means that the value of the setting will be the same as the passed-down environment. A new stand-alone variable or existing variable can be designated for use as an environment setting. The contents or value of the variable will be used for the environment setting. The steps and example below show how to set the Output Coordinate System environment. In ModelBuilder, right-click the model canvas and click Create Variable. From the list of data types, select Coordinate System, then click OK.
A new variable is added to the model. Right-click the variable and click Rename. Rename the variable Result Coordinate System. Right-click the ModelBuilder canvas and click Model Properties, then click the Environments tab. Expand the tree and check the Output Coordinate System environment. Click Values. The Environment Settings dialog box opens. Expand Output Coordinates. In the Output Coordinate System drop-down list, click As Specified Below. In the unlabeled drop-down list, choose Result Coordinate System (the model variable you created). Click OK. The value of the Result Coordinate System variable will now be used as the Output Coordinate System environment by all processes in the model. 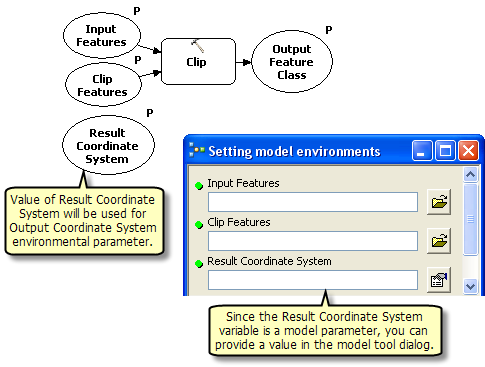 To expose the Result Coordinate System model variable as a model parameter, right-click the variable and click Model Parameter. The model below shows this technique using the Clip tool, along with the model's tool dialog box opened from the Catalog window.